When is a line a line, and when is it merely prestigious? At Expo 2010 [according to Turkey], of course. Even before Expo 2010 [the Shanghai World’s Fair] opened on May 1, media, organizers, and visitors were buzzing about the epic lines expected at certain national pavilions. To be sure, lines (queues, my British friends) are reality at all modern Expos. But China, with its vast population, and determination to secure 70 million visitors before its six month Expo ends, magnifies the issue. Nonetheless, despite reasonable concerns about Shanghai lines dating back years, rumors have been circulating for months that “some” national pavilions were built, and have been managed, to ensure and lengthen the lines and waits – for the sake of national prestige. So. 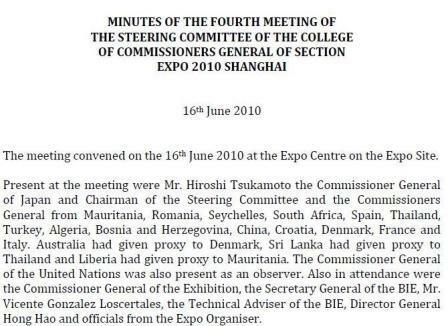 On June 16, at a semi-regular meeting of Commissioners General held at the Expo site, the rumors became thinly-veiled accusations: mid-way through the meeting, the Commissioner General of Turkey all but charged the Saudi Arabian pavilion – notorious for its nine hour-long queues – with purposely manipulating visitors and wait times so as to appear as if it’s popular. His finger also turned to the Germans, hosts to six hour lines, for much the same, and more. 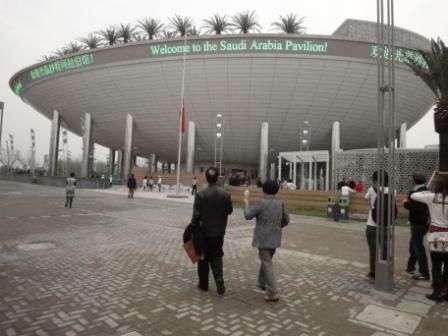 Below, the Saudi pavilion as encountered during the Expo’s soft opening, before it became popular. The Commissioner General of Turkey notes that some pavilions are designed for long queues and that even some pavilions want long queues as a matter of prestige. He suggests that pavilions should speed up access at their entrances and allow, as is the case at the pavilion of Turkey, free entrance and exit to shows rather than closing people inside until the show is over. He notes that Turkey receives 45,000 people per day whereas Saudi Arabia is at around 25,000 per day. He also stresses that Germany had faced the same issues at Expo 2008 Zaragoza due to the design of their pavilion. This blogger notes that Turkey rarely has a significant wait in front of its pavilion, despite the fact that – if the 45,000 figure is correct – it exceeds or equals the visitation numbers at many other popular pavilions, such as the well-queued United States pavilion. The Commissioner General of China notes that in the Shanghai Morning Post an article was recently titled “Not to visit Saudi Arabia is regrettable, to wait 8 hours is also regrettable.” He suggests that the good experience from the China pavilion be used to solve this issue as 8 hour queues are a waste of time for visitors and give a bad experience especially as the weather is getting hotter. If a reservation system exists it will create an even dispersal of visitors throughout the site. In other words: get with the program, do like China, and set up a reservation system. And if you can’t do it yourself, Hong Hao, Director General of the Expo, volunteered (in the minutes) to do it for you. Take-away message: don’t blame long lines on the Expo organizers. Blame them on manipulative and/or short-sighted pavilions. I tend to agree. Two days after the June 16 meeting, Han Zheng, Mayor of Shanghai, offered assurances that “measures” would be taken to shorten lines in advance of the mid-summer heat. Whatever those measure are, the staff at Shanghai Scrap humbly offer an additional suggestion for dispersing the crowds in front of the German and Saudi pavilions: circulate a Chinese translation of the June 16th minutes to Chinese visitors as they arrive at the Expo. I’m pretty sure that they won’t take the news that they’re possibly being manipulated for Saudi and German prestige won’t be taken well. Pregnant women are very difficult to verify and heavily pregnant women perhaps should not be visiting such an event. Women with babies should also not be given priority as it is not the babies enjoying the event but rather the parents. And if that’s the scale of the issues being considered, then I’d say that there really aren’t many serious issues at all. This entry was posted in Expo 2010 by Adam. Bookmark the permalink. You’re not actually surprised that pavilions manipulate crowds are you????? When I visited the Saudi Arabia Pavilion I noticed that the long line is indeed a design issue. Their people movers are too narrow and apparently it’s impossible to widen them. They might be able to move more people by increasing the speed of the movers, but they would also need to reduce the length of their movies, which is hard to do, especially with the IMAX film. And still, I don’t think the difference would be significant. Having worked in Expo’98 Lisbon and Expo 2000 Hannover I conclude that in Expo 2010 Shanghai pavilions care much less about their common visitors. This is not only the case of huge waiting times in line, but also having the VIP access next to the line so most visitors can see how special guests skip the line (e.g. Canada), or having the inaccessible VIP area exactly in the middle of the pavilion as a reminder of hierarchies among visitors (e.g. South Africa). Thank you for sharing this case with us. I’m glad that this situation is being discussed among Commissioners General. Is Saudi Arabia giving away large sums of money? Has it brought the Kaaba to Shanghai? Why on earth would anyone wait all day for a pavilion? The reason would be that the Saudi pavilion offers the world’s largest (correct me if I’m wrong) 3-D IMAX movie screen for a ten minute short film. All of the pavilions feature a short film as one of the major components of their presentations, for the most part, Saudi Arabia spent its vast sums of money that none of us are surprised about to make a display that is entirely out of proportion (in my humble opinion) with their role in the world. But presentation is everything, and people buy into it, hence eight hour waits. I was able to see the Saudi pavilion a few weeks ago and it’s an over-rated nothing. If it were in a shopping mall nobody would bother to visit. Too bad people are being fooled into thinking there’s something special there. The Saudi Arabia Pavilion was well done, but I wouldn’t say it is worth such a long wait. Saudi Arabia invested something around 150 million dollars in its national section (pavilion plus events) in Expo 2010 Shanghai. The IMAX film is not 3D, but it might easily be the biggest in the world. What’s interesting is that they project the movie on the floor and walls while visitors are moved on an airport-style people mover. I suggest watching Urso’s film (link above) and mine in YouTube (http://www.youtube.com/watch?v=0C8EXkwXVJg). I think the videos are very well done but the main one is a bit long. The first one (non IMAX) provides some views on the Saudi Arabia-China relation and on the diversity of its cities. The second one (IMAX) is an immersive experience. low daily attendance limits can also mean that the paviolion is not designed to hold more than a certain amount of visitors at any one time. This could be down to physical space, or the fact that the design of the building means that if you have more than X people in the same place at any one time, the stuctural integrity of the pavilion is under threat. Short time frame plus bad building practices, plus the fact that this is china and many corners are cut. The Shanghai hosts have done a fine job. It would be excellent if they would publish their review findings so that they can be used by the organizers at the forthcoming Yeosu, Korea 2012 Special World Expo and the Milan 2015 Universal World Expo. The lines at Expo were quite long in september but was able to enter most pavilions within one hour wait. I refused to visits pavilions with too long wait. If Saudi Arabia, Germany and many Asian countries can control or make long lines for the supposed quality of their pavilions well “stuff it” because I did visit many small countries pavilions which were very interesting in my opinion (of a North American visitor). The content of many pavilions was deceiving compare to other Expos I have visited. The popular stamps at pavilions was agressing me with those young visitors trying to get 10 or even more passports stamped at a time. The purpose of having your souvenir passport stamped is for a personnel souvenir and not to sell them back on Ebay or other online stores. I was disappointed of that type of things on the site but besides that it was fun to visit and will keep a beautiful souvenir of this Expo 2010.